Golden Gate (GG Developers SPC), a growing real estate development company in Bahrain, has acquired the necessary licences for its operations following its compliance with the standards set by the kingdom’s Real Estate Regulatory Authority (RERA). Sheikh Mohammed bin Khalifa Al Khalifa, chief executive officer of RERA, said that the authority is continuing to issue the necessary licences to developers of off-plan sales developments based on Law 27 of 2017. RERA is assisting developers and other key stakeholders in the real estate sector to ensure compliance with the law. RERA has granted Golden Gate two licences: a RERA developers licence, which is required for auditing and qualifying developers, and a RERA off-plan sale development licence, which allows the company’s (Golden Gate) project at Bahrain Bay to be developed. Golden Gate, a 140,000-sq-m project in the heart of Bahrain Bay, has 746 apartments spread over two 53-storey and 45-storey towers. The project is expected to be the tallest residential structure in the kingdom. It offers parking spaces for 999 cars spread over seven floors. Chairman and board member of Golden Gate Ishaq Al-Kooheji explained that the award of these two licences together is a result of the cooperation between the company and RERA. 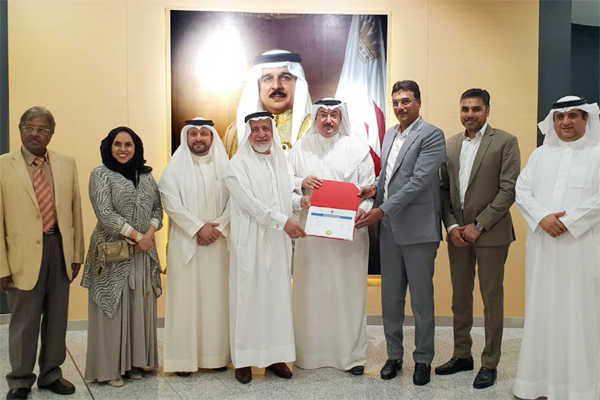 “We are keen on continuing to work with RERA in order to achieve our common goals and make strides in the development of the kingdom’s real estate sector and to promote economic growth and investment in Bahrain,” stated Al Kooheji. Golden Gate has met the requirements for these two licences as a result of its full compliance with the new standards set by RERA which are in line with international best practice in the field of real estate development. “The company is committed to implementing all laws and regulations related to real estate development,” said board members from Ajmera and Mayfair, two well-known real estate developers from India, who are joint venture partners with Golden Gate. Vice president of sales and marketing, Eman Al Mannai, pointed out that the project has met the requirements of establishing the ‘off-plan sales register’ which enables the developer to sell the units before the completion of construction. “This includes the right of the buyer to register their name in the off-plan sale register which is maintained by SLRB. The register will list additional information such as the area of the unit, its value and the number of stage payments,” she explained.